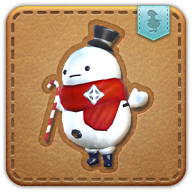 Summon your Hoary the Snowman minion. Hoary the Snowman was a jolly happy soul, without a pipe, and without a nose, and two eyes made out of something other than coal. Probably slag. While no one knows the exact origins of Hoary the Snowman and the legends surrounding this animated mass of ice and snow, the gifting of dolls created in his likeness to good girls and boys is not uncommon during the Starlight Celebration. Grants action party the ability to deal extra damage to Arcana Stones.